Did you know that not all fonts are safe to use in PowerPoint? There are some fonts that will radically mess up your presentation and in this article, you’ll learn which ones they are and how to make sure you’re using the safest possible fonts for PPT. You’ll also see some examples of modern fonts and cool letter fonts and font you can use in your PowerPoint presentations. To learn how to quickly replace all the fonts in your PowerPoint presentation, see PowerPoint change fonts on all slides. Let’s first address the first issue. Although PowerPoint is supposed to be compatible across versions and installations, there are a few areas where it’s not compatible, and that’s with fonts. Even with the default fonts that come with your computer and with Microsoft Office. If you use a font that isn’t supported by the computer that’s opening the presentation, the font will be substituted for the theme’s default fonts, most often Calibri. If you’re only ever using PCs and PowerPoint 2016, for example, then I wouldn’t worry about it too much. But if there’s a chance your presentation will be displayed on a computer using an older version of PowerPoint (especially pre-2010), or if the computer is a Mac, then you need to be careful of the fonts you’re using. And chances are that you’re going to be in this situation, so please pay attention to this. The term ‘safe fonts’ refers to the standard fonts that are guaranteed to display correctly on all devices and all versions of Office. 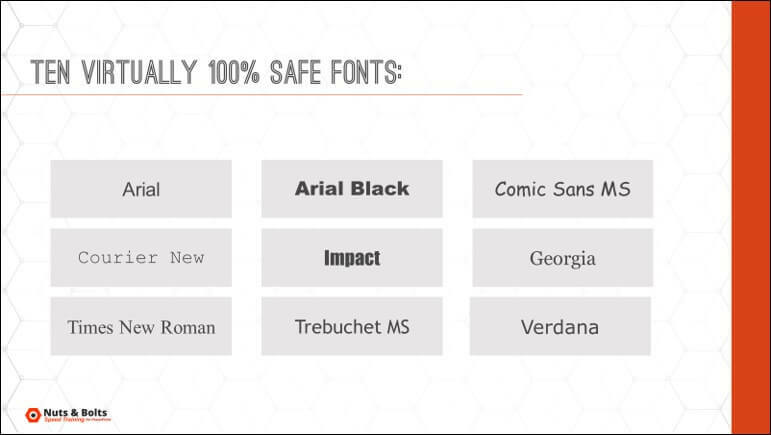 For a slightly more expanded list of safe fonts, check out Julie Terberg’s article on safe fonts here. While these are definitely restrictive, if you want to truly be compatible across all devices, those are the few you can use. If you’re ever going to build a presentation with a risky font, what you should always do is test the presentation as if the fonts were to revert back to default. That way you know if would look okay in the event that the fonts didn’t carry over. The fonts that are likely to break your presentation are: Custom fonts. Custom fonts are fonts that you have installed yourself on your computer. And while custom fonts look cool, the problem about using them in your PowerPoint presentations (or Word, Excel)… is that they will only display on another computer if you install them there too. You can do that to a boss or colleagues, but if you’re sending out the document to a bunch of people externally, ensuring that they install the font you’re using on their computer can be very hard (if not impossible) to do. Note: It can also be illegal if your font is copyrighted and if you’re the only one allowed to use it. Custom fonts are fonts you’ve downloaded for free on the web, or they can also be fonts that you’ve purchased. 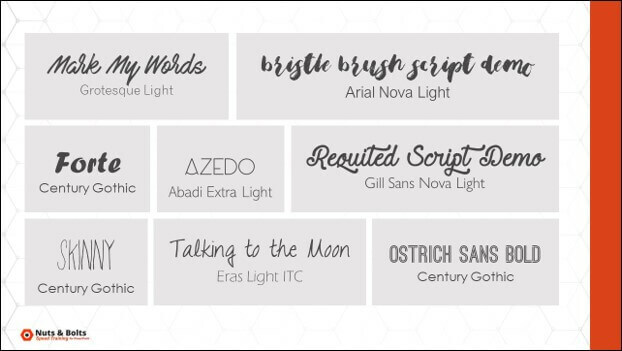 For more suggestions, check out the section the best places to get free fonts in our favorite PowerPoint resources article. Using custom fonts is a great way to make your presentations stand out and look super cool. One way to go around having to install custom fonts on all user computers, is to embed them. However, we DON’T RECOMMEND this method. It tends to not work very well, and some fonts won’t even let you embed them based on their licensing. It’s more likely to screw things up for you and leave you stranded. Another way to use custom fonts while still having them display correctly on any device, is to save your presentation as a PDF or as a PowerPoint picture presentation. To learn how to convert your presentation into the PDF file format, see Convert PowerPoint to PDF. To learn how turn your presentation into a picture presentation, see Protect your Presentation (PowerPoint Picture Presentation). Just keep in mind that once you've converted your presentation into these alternate formats, your client, boss or colleague will not be able to edit those slides. That said, at least they will be able to view your custom font. The rule of thumb should be to avoid using custom fonts wherever possible in presentations that need to be edited by more than one or two other people. If you have to use custom fonts, you can save your presentation as a picture presentation or convert your presentation into the PDF file format. And again, test, test, test! It can only help to make sure you know how your presentation will look on older versions of PowerPoint and on a Mac/PC.